← Happy 40th Birthday, Magnuson-Stevens Act! I had the opportunity to visit Brad Pattie recently. I’d heard that he was ill with cancer so I called him, and during our discussion we touched on what he did during his career with the Washington State Fisheries Department (WSFD). In 2012 his son Jody Pattie, who I met at a church retreat, asked me if I wrote the “Catalog of the Russian Fleet” that his dad, Brad, used when he was with the WSFD (Washington State Fisheries Department) and I said that I did. So I made arrangements to visit Brad on October 23, 2012, after losing track of him over the years, and we shared memories of the flight we made together over the Soviet vessels in 1967. After I posted the information we had put together I contacted Gene DiDonato, Brad’s boss in those days, who was retired. In July, 2013, Gene and I made a trip to the WSFD in Olympia, Washington where we met with Debbra Bacon and Greg Lippert, part-time WSFD historians, whom he had contacted before our trip. I’d hoped they could come up with reports of the flights and they did, all twelve of them. The First Flight, which was made on July 17, 1967, had my name on it as an observer. After so many years some memories fade while others remain and I remember the airplane, but not the airport from which we took off and returned. That turned out to be Olympia airport and not Boeing Field, Seattle from which all the later flights had originated and returned. I’d also estimated that we observed at least 30 Russian vessels that day, but the report shows that we saw 50. Brad Pattie was on 10 of the flights: he missed two of the last three but made the last flight with coworker Nick Pasquale on October 4, 1968. During our latter two visits on September 19, and October 10, 2015, Brad and I talked about his job with the WSFD. Not only had he recorded information on those flights, he also had the job of checking the fishing log kept by the skippers of individual vessels in the Washington trawl fleet, matching the information to their fish tickets required by the state, giving the pounds of fish landed. This is the system that Lee Alverson was involved with when he worked for WSFD between 1954 and 1958 after resigning from the Federal Exploratory Fishing group (FEFG). He also developed an interview system with a voluntary fishing log before returning to FEFG as the director (1). As far as I know the log is still in use today. Brad was hired by the WSDF in 1963 and went to work in the trawl program with Ed Holmberg, Nich Pasquale and Jerry Reeves. The team visited the trawl fleet to review the logs as they returned from their two week trips and were unloading the catch at one of the fish processing plants in Seattle, Everett, Bellingham or Blaine. Each haul was recorded in the log, giving its location, depth and duration as well as the estimated weight of each species taken and the total combined weights. When the vessels arrived at the processing plant the catch was unloaded, the weight of each species was noted and a fish ticket issued. The catch was sorted when the fish were first caught and was stored in the fish hold in separate bins. To reduce spoilage, individual fish were packed in crushed ice. 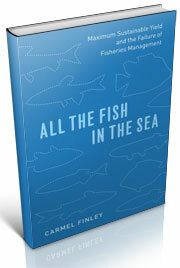 While at sea only the fish that the processing plant would buy were saved. The skipper’s log indicated what part of the catch was returned to the sea. At the fish plant a large bucket was lowered into the hole and loaded with fish stored inside bins. Only one type of fish was placed in the bucket since the fish house had different prices for different fish. The loaded container was lifted up to the dock, dumped into a cart and moved to the scale and weighed. The crushed ice used to preserve them remained in the hole until it was later dumped overboard. Once the vessel was unloaded, the total weight of all the fish was added up and a fish ticket issued. The skipper received a check from the fish house for the entire catch. Brad said that the skippers’ estimates in the logs were very close to the fish ticket when it was issued. Brad and the team collected this data in 1966 when the Washington State landings of Pacific Ocean perch (POP) peaked. The Western Flyer was part of the Washington trawl fleet, as Kevin Bailey pointed out in his book (2) that Dan Luketa had converted her to a trawler after the California sardine fisheries collapsed. I am sure she arrived at the Main Fish Company in Seattle full of POP from Queen Charlotte Sound during this time as Brad remembers the New Washington and Morning Star, both converted sardine seiners, unloading at Bornstein Fish Company in Bellingham with record catches of POP taken from the same fishing grounds in Queen Charlotte Sound. Brad gave me a number of Washington State Annual reports and from them I learned that in 1952 POP was separated out of the rockfish category which grouped all the rockfish together. He and the team recorded the rise of the POP landings until its peak in 1966 with a little over 17 million pounds. Debbra Bacon sent me a copy of Washington State Technical Report No. 68 (3), which gave the landings of Washington POP from 1966 to 1979. Using this information and the annual reports I plotted the annual catch per year of POP landed in the state of Washington. After 1966 the team started to define which individual species of commercial rockfish made up the group of rockfish, and observed the declining landings of POP in Washington due to the arrival of the Soviet fishing fleet in 1966 and the tremendous effect it had on this resource which became the catalytic year that changed the industry. The Western Flyer was converted to a king crabber and entered the expanding Alaskan king crab fisheries because of this decline. Once the 200 mile Exclusive Economic Zone (EEZ) was put into effect in 1977 by the Magnuson Fishery Management Act of 1976, Brad said that the Canadian government let the U. S. trawl fleet continue fishing Queen Charlotte Sound for an additional two years before it was closed to them, because of the data obtained from the Washington Trawl Log system that the skippers kept and Brad and the team recorded. I wondered why there was a second lower peak of little over 13 and a half million pounds of POP landed in 1970 when the resource was declining. 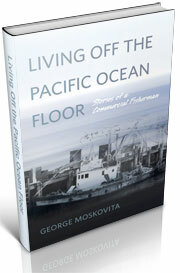 I thought about my trip on the Sea Freeze Pacific in 1969 when I was invited as an observer on her first fishing trip. She sailed from Bellingham Cold Storage on Nov. 14, 1969 and returned there on Dec. 14, 1969 to unload the catch. She was one of two 290 foot factory stern trawlers built for the United States fishing industry under the 1964 Fishing Fleet Improvement Act and was designed to operate in the Pacific among the foreign trawlers fishing POP, using similar fishing gear and often fishing on the same grounds. 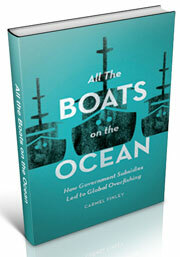 This was a radical change for the Pacific trawl fisheries, a huge vessel that could catch and process the fish at sea. I located a copy of the report I had written and found that I kept a fishing log for the skipper, the same one that Brad Pattie talked about that he and his team matched with the fish ticket when the vessel returned. The Seafreeze Pacific landed all its products in Bellingham from all five trips, although the vessel had also fished along the coast of Alaska during some of her trips which other US trawlers seldom did. I don’t remember actually filling out the log, but using copies of the reports I recalled the total catch of POP for all five cruises which came to 3,168,000 pounds. If this value is removed from the landing made in 1970 it would indicate the steady decline of the POP fishery. The Sea Freeze Pacific made a gallant effort at saving this fisheries, but it was too late and the excellent product it landed could not economically support the operations of running a large factory stern trawler. Brad lost his battle with cancer, but before he passed away on Jan. 22, 2016 he wanted to share his experiences during his career in Fisheries, especially the rise and then the fall of POP in the U. S. market due to the Russian invasion of the resource during 1966 and 1968. We are fortunate to have his memories. (2) Bailey, Kevin M. (2015), The Western Flyer, University of Chicago Press, 146 pp. This entry was posted in Dayton Lee Alverson, Environmental History, Exploratory Fishing Base, fisheries science, Fishing, History of Science, History of Technology, Ocean fishing, Pacific Fishing History Project, R/V John N. Cobb, Sebastes rockfish, Soviet environmental history, Soviet fishing, World History. Bookmark the permalink.